A normal starfish aside from the razor sharp implants along it's legs. 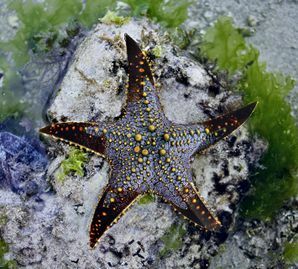 The Ninja-starfish is a beastie which may be encountered when sailing on an ark. Found deep underwater, this creature is the nightmare of all heroes at sea. Her sharpened edges can slice through even the thickest of sheathing, tear up sails and even go as far as to guzzle the hero's beer once an ark has been destroyed. An act to which the hero can only turn away and sob, as he floats away on some drift wood from his decimated ark. A true monster indeed. In usual movies the villain has normally had a hard life and was moulded that way by "social conditions". They are also sometimes rich and have a dastardly plan to do something dastardly. When you've got that much money, why not? You'll always be remembered then! Even if it was for something really stupid like planning to buy out all mattress shops in North America. This however, never happened to Ninja-starfish. She was born into a middle-class family of sea-bed dealers, and had dreams for her own success. First she started trafficking coral. Then she did the kidnappings. After that she was hired by the Undersea Mafia and had her blades implanted. She confidently walked through the halls of the undersea Mafia's HQ, giving intimidating glares to underlings, gracious smiles to superiors, well, not that their were many of those. As she approached the big wooden door with the bright neon sign labeled simply The Boss she began to lose some of her confidence. To run such an enterprise, this boss would have to be dangereuse wouldn't it? She knocked firmly on the door, and then watched as it slowly creaked open. Her gaze went upwards, expecting to see a massive creature 80 feet in height. When she saw the 13 year old boy she was quite disappointed. Okay sure, he still looked tall from a starfishes height, but no where near 80 feet. In truth, this was an undersea god. An almost unknown counterpart of the more common overland god, though still threatening. The Boss typed some words into his phone, hit send and then a loud voice reverberated over divine speakers. "TO BATTLE YOU GO, FAITHFUL NINJA-STARFISH! DO ME PROUD!" With that he pressed another button, and Ninja was whizzed off on a powerful current, ending up above sea level. "See the ship on the horizon? That is the ark of one of my enemies champion! Strike it down! Take this gold to bribe your way out a fight should you lose!" With that he left to do more underwater divine duties. So Ninja-starfish swam out to the ark and challenged the hero, it was the commence of what could only be called an epic fight very wishfully. In short, Ninja's opponent's god wasn't as AFK as hers, and with a few punishments, quickly knocked her down, at which point she surrendered the gold. This would happen multiple times over her lifetime, sometimes she was lucky and won! This page was last edited on 18 April 2019, at 19:14.